Hear the waves, not the traffic! 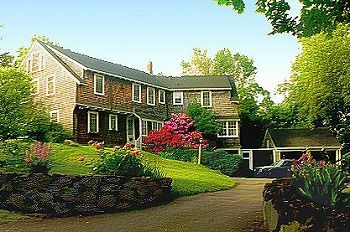 Pheasant Hill B & B is located at the edge of town on an acre of landscaped ground. On top of a hill with views to the Atlantic, this 1917 summer home has character. You feel it when you walk in the door - very comfortable, relaxing, and, as one guest put it, "very civilized". Three charming guests suites offer an eclectic mix of European style antiques, local finds, and hand-painted murals and furniture. Modern comforts include king, queen or twin beds, private baths, sitting rooms, TV, radio/alarms, A/C, and in-room refrigerators. Continental breakfast buffet. This and other Marblehead Bed and Breakfast Inns can be found here online in The Register.